Down Under Knives for sale are designed to be the ultimate bowie knife. These quality knives are backed by a manufacturer five-year warranty against all defects in materials and craftsmanship. Red Rock Raptor Bowie Knife for sale measures 15 ½ inches in all. These popular knives have a sharpened 10 ¼ inch bowie style blade which is 5.5mm thick and made of 440C stainless steel. Down Under uses a dual heat treatment which results in an edge HRC 58-59 and a back HRC 45-46. The Red Rock Raptor Bowie has a solid brass guard and pommel and a genuine leather handle. These knives weigh approximately 24.3 ounces. 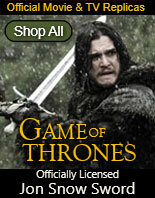 They include a genuine leather sheath which features reptile embossing. Buy the Red Rock Raptor Bowie made by Down Under for $179.99. Outback Bowie Knife for sale measures 16 inches in all. These popular knives have a sharpened 11 inch bowie style blade. The 6mm thick blade is crafted of 440C stainless steel with a blood groove. Down Under uses a dual heat treatment which results in an edge HRC 58-59 and a back HRC 45-46. 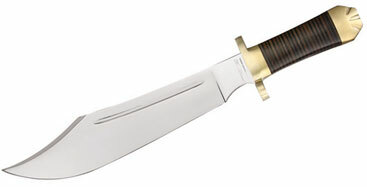 The Outback Bowie has a solid brass guard and pommel and an ebony and leather handle. These knives weigh approximately 28.2 ounces and include a genuine leather sheath with a sharpening spike. 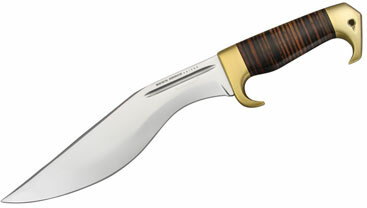 Buy the Outback Bowie Knife beautifully crafted by Down Under for $189.99. Razorback Bowie Knife for sale measures 12 inches in all. These popular knives have a sharpened 7 inch bowie style blade. The 440C heat treated stainless steel blade has a width of 2 inches and is 5.5mm thick. They weigh approximately 16.402 ounces and feature a solid brass guard and pommel. These knives also include a genuine leather handle and sheath. Buy the Razorback Bowie Knife made by Down Under for $189.99. Toothpick Bowie Knife for sale measures 16 ¼ inches in all. These popular knives have a sharpened 11 ¼ inch bowie style blade. The 440C heat treated stainless steel blade is 5.5mm thick and is 1.7 inches wide. These knives weigh approximately 22.2 ounces and feature a solid brass guard and pommel. The Toothpick Bowie includes a genuine leather handle and leather sheath. Buy the Razorback Bowie Knife made by Down Under for $199.99. Mistress Bowie Knife for sale measures a hefty 17 ¾ inches in all. These popular knives have a sharpened 13 inch bowie style blade. The 440C dual heat treated stainless steel blade is 5.5mm thick and is 2 5/8th inches wide. They have an edge HRC 58-59 and back HRC 45-46. These knives weigh approximately 29.3 ounces and feature a solid brass guard and solid brass pommel. The Mistress Bowie includes a genuine leather handle and genuine leather sheath which features a floral pattern. 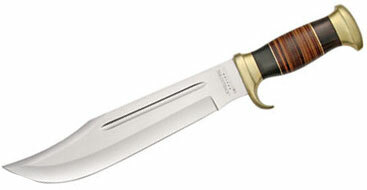 Buy the Mistress Bowie Knife made by Down Under for $239.99.